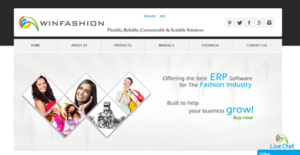 WinFashion ERP is a flexible and scalable fashion ERP software for fashion, Apparel, Furniture, Foot Wear, Office supplies, and Jewelry industries. It’s a fully customizable solution for apparel industry that leverages smart technology to streamline all functions of fashion businesses. The platform provides powerful features needed to solve business needs and manage the day to day functions. It is a scalable fashion software that works for industries which involve manufacturing, order processing, sourcing, purchasing, shipping, sales, accounting, and inventory management. WinFashion is Multi-language compatible and is built for different devices including PC, smartphones, and laptops. The program has a web-based product data management (PDM) version that allows businesses to integrate information from all key business functions with ease. WinFashion ERP is a secure ERP solution that offers numerous benefits to users in the fashion industry. It’s a powerful solution that provides an impressive set of features crafted to help you streamline your workflows. The platform comes in different versions including a web-based module, mobile app, and desktop version. The web-based version allows you to access the solution anytime, anywhere around the globe. One of its main features is the mobile application module. WinFashion provides three Android and iOS mobile Apps that are aesthetically designed using the latest technology. The iTradeshow mobile APP allows you to go paperless to eliminate the tedious data entry and take orders at the trade show. The second App is the iPDM which is a reliable application used to automatically enter descriptions, photo, and style number of new styles or samples into your system from mobile devices. In addition, the solution has a catalog app that provides a state-of-the-art view of new products on mobile devices. This app allows you to visualize your catalog, and view new designs, and other vital details. It offers unprecedented exposure to new designs to help you acquire more clients with less effort. The inventory management module is another powerful feature. This module empowers you to manage both raw materials and finished goods all from a centralized location. Better still, WinFashion provides multiple reports including management reports, raw material reports, and work in process reports. These reports deliver useful insights that enable you to make informed decisions at every level of management. If you are interested in WinFashion ERP it may also be a good idea to examine other subcategories of Best Apparel Management Software collected in our base of SaaS software reviews. Companies have different needs and requirements and no software platform can be ideal in such a condition. It is futile to try to find an ideal out-of-the-box software system that fulfills all your business needs. The smart thing to do would be to customize the application for your unique needs, staff member skill levels, budget, and other elements. For these reasons, do not hurry and subscribe to well-publicized leading solutions. Though these may be widely used, they may not be the ideal fit for your unique wants. Do your homework, check out each short-listed system in detail, read a few WinFashion ERP reviews, call the maker for explanations, and finally choose the product that provides what you require. How Much Does WinFashion ERP Cost? WinFashion ERP doesn’t publish its enterprise pricing details to the public. Contact the vendor for a detailed pricing structure. We realize that when you make a decision to buy Apparel Management Software it’s important not only to see how experts evaluate it in their reviews, but also to find out if the real people and companies that buy it are actually satisfied with the product. That’s why we’ve created our behavior-based Customer Satisfaction Algorithm™ that gathers customer reviews, comments and WinFashion ERP reviews across a wide range of social media sites. The data is then presented in an easy to digest form showing how many people had positive and negative experience with WinFashion ERP. With that information at hand you should be equipped to make an informed buying decision that you won’t regret. What are WinFashion ERP pricing details? What integrations are available for WinFashion ERP?